NEXT | What surprises do you think are coming after WoW's Patch 8.2? 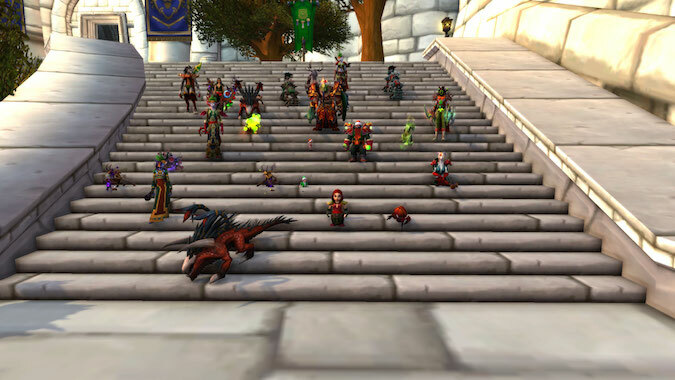 When transmog was first introduced to World of Warcraft with patch 4.3 on November 29, 2011, I looked askance at it — why would I want to change the appearance of my gear? Hadn’t the designers worked hard to create gear reflective of my class? I sort of felt I was being disrespectful to those designers. That feeling didn’t last long. By the middle of Mists of Pandaria, I had fully embraced the joy of changing the look of what I wore. It was a bit of a hassle because you didn’t know whether an item was something you already knew or was something new. Mists of Pandaria introduced the Grand Expedition Yak — with the portable transmogrifier. I didn’t have to go to Stormwind now to change my appearance. It took two expansions but more changes were coming. In the Legion pre-patch transmogrification underwent evolution with the addition of the Appearances tab. Shirts, tabards, and all our items in Void Storage were added to the vast transmog library. 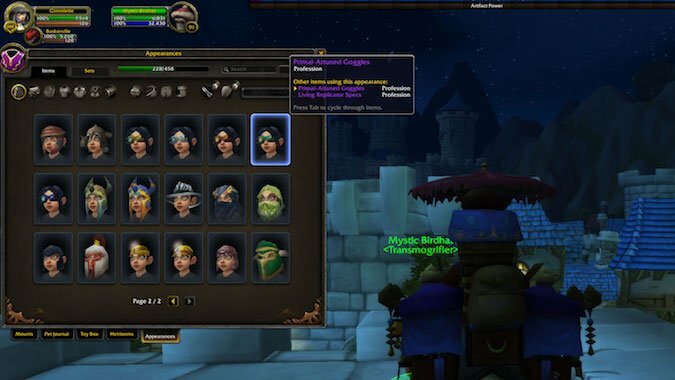 So was any gear from questing — even items you turned down. I remember opening up the tab on the first day and seeing pages and pages of cloaks. In the Appearances tab, we got a wardrobe and the ability to see what gear looks like on our character. If you got a new piece, it was instantly added to your wardrobe and you could view it in the model viewer. You got a notice “You have not collected this appearance.” when you moused over an item. Other than a notice that a rare mount has finally dropped, this was — and still is — one of the best sentences in the game for me. Combine immediate addition of gear to the wardrobe with the yak and changing gear on the fly was easy. There were restrictions on what could be transmogged, but these changes were very welcomed by those of us who like this aspect of the game. And let’s not forget the Trial of Style. First introduced in March of 2017, this event is totally for transmogs. 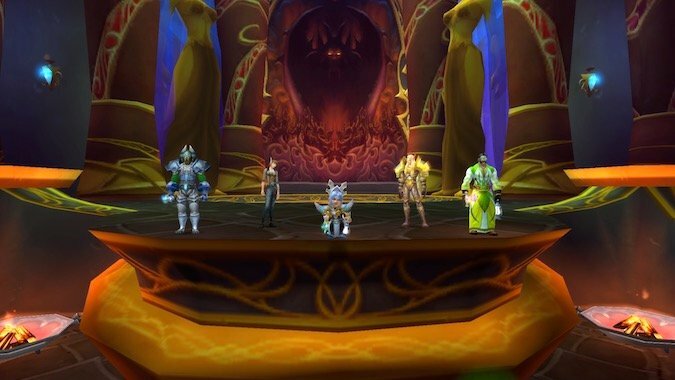 During the too-short event, you queue at all Ethereal Transmogrification NPCs, joining a group of five other people. A theme comes on your screen and you have access to all your gear. You create a look which you think embodies — or maybe doesn’t — the theme. Everyone votes on who has best outfit and that person is the winner. A second and third place finisher is also named. You get tokens which are used to buy cosmetic items from shirts to gear. All barbershop and Void Storage fees are removed for the week of the event. For those of us scrounging the world for “You have not collected this appearance,” this event is eagerly anticipated. As much as I love transmog, there are ways it could be improved. Transmog can’t be sorted by color. If I get a great new chest piece appearance it takes me at least an hour to page through everything to coordinate with this new piece instead of just looking through the ones that have a splash of green or gold. I would probably never use my Appearance tab in any other format — trust me, developers. You can’t sort by expansion, either. If you are looking through the “Not Collected” section and you find a piece, if the tool tip lists a specific boss in a specific raid you have to know which expansion it’s from. This isn’t an issue for those of us who have been around for years, but for those people who are new to the game or just don’t remember, being able to sort by expansion would not result in having to make a list and then going to a web site to figure out where something was. This is so needed with crafted gear in particular. I found the perfect chest piece for the guild’s upcoming transmog contest and have been sorting through appearances trying to find companion pieces. I have to make lists, go to another website, and spend extra time there figuring out where the recipe drops. I’d like a note by a name that a) they are a trainer and b) they are located in this place. Just telling me the vendor who had the pattern was in Redridge was not much of a help. 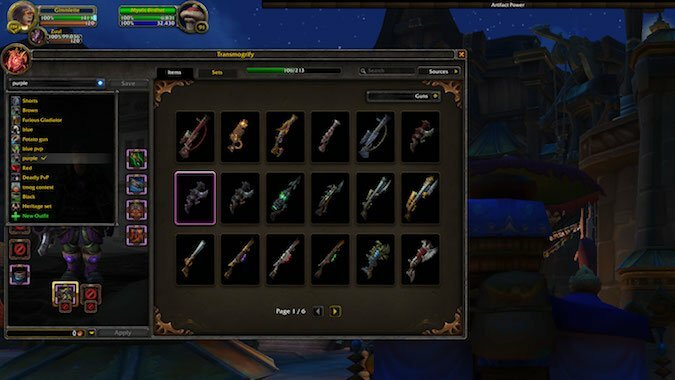 The horse icon on our master toolbar and the information on the transmog vendor should be close to the same. Right now, if you want as much information on an item as possible, you have to look at both screens. It seems to me you could put the same information on both panels since you are dealing with the same item. People would like more than 20 appearance slots. I have used a dozen of the ones available, but I know guild members who have all of their slots filled with sets. And the thing with sets, could you group those by expansion, too? I forget which PVP set goes with which expansion and I’d like to go to the right vendor to collect them. Finally, can we please have white and gray gear be transmoggable? Some of the gray sets are good looking. I won’t advocate for allowing the Legendary weapons to be transmogged, although a lot of people want that. I get that Blizzard feels transmogging the appearances means you’ll have a whole bunch of people running around with appearances on characters who didn’t earn that item. Personally, I think it’s a badge of honor to be able to transmog the Legendary weapon appearance. These are not easy to get and it says to me you put in the time to run the raids. Those are my thoughts. I have so much fun chasing down the elusive transmog. Is there something I’ve forgotten which would make transmogging your appearance more fun or easier? And how “addicted” to this are you? I ran Uldaman on my Leatherworker for scorpid scales and added another 8 pieces to my collection. That was more exciting than skinning scorpions.